The role of anti-wrinkle cosmetic injections is to relax wrinkle-causing muscles, thereby softening and preventing the development of expression lines, creating a smooth and rejuvenated appearance. Anti-wrinkle injections contain a purified protein which has over a 20 year clinical safety profile, and has been used to treat more than 20 million cosmetic patients worldwide. Prior to its use in the aesthetic cosmetic industry, the product that we use to soften lines and smooth wrinkles has been used to effectively treat many different types of disorders, such as Blepharospasm (uncontrolled eyelid twitching), Cervical Dystonia (spasmodic movement of the neck & shoulders), as well as to relieve the muscular tension associated with Cerebral Palsy and Stroke. It is a wonder drug! The Anti-wrinkle injectable product has a reputation for being a well-studied and safe medication, which is administered only by experienced medical practitioners. 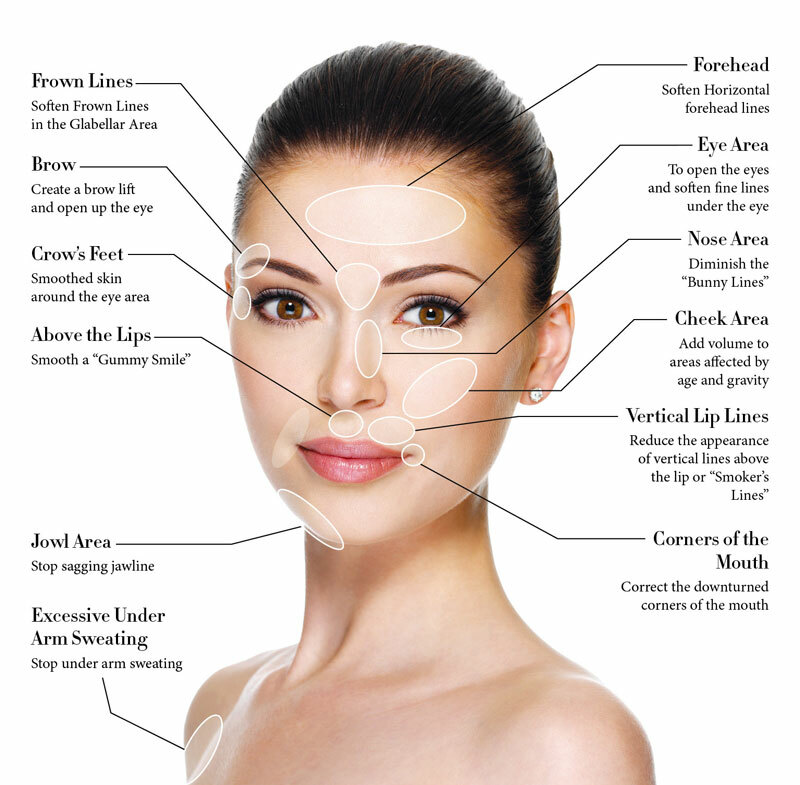 DermaCare is proud to be solely using class leading anti-wrinkle and dermal filler products manufactured by Allergan . Due to legal reasons we are prohibited from displaying product names and references. TGA regulations for advertising of schedule 4 substances including anti-wrinkle and dermal filler products. Which areas can be treated with anti-wrinkle injections? Injections may be used to relax the frown lines between the brow, often seen when concentrating or squinting. The horizontal lines on the forehead are caused by the contraction of the Frontalis muscles when raising the brows. Help to polish the crow’s feet or laugh lines around the eyes. The bunny scrunch across the nasal bridge, usually as a result of squinting and smiling. The vertical lip lines which are activated when talking, eating and drinking. We can also help to open the eyes by relaxing the muscles responsible for brow positioning. Anti-Wrinkle injections are the fastest-growing cosmetic procedures in the industry. The treatment is one of the safest available for the reduction or softening of wrinkles. We frequently use these injections to treat frown lines between the eyebrows, forehead wrinkles, and lines around the eyes (Crow’s Feet). It may also be used to treat lines around the mouth and those on the neck. A few tiny injections are administered to the skin which relax the muscles and thus, allows for a smoother, more refreshed appearance. The effect will take three to five days to appear and will generally last for 3-4 months. It is important to note that the creases at rest, known as ‘hyper dynamic’ lines may not be completely relieved after your first anti-wrinkle cosmetic treatment, however will continue to polish with future injections. This is because the active muscles are given a chance to relax, enabling the creases to weaken over time. Anti-wrinkle injections may also be useful to prevent the development of lines and wrinkles before they become apparent. This Anti-Ageing cosmetic injectable procedure is a medical breakthrough in the quest for a youthful and rejuvenated appearance. Anti-wrinkle injections are a safe and effective procedure that have drastically changed how and why we stay looking and feeling young.